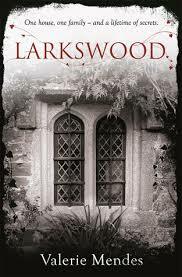 Larkswood was a gift from a friend and I wanted to read it because of this. If I’m honest, I wouldn’t have finished it otherwise. The book cover suggests an enticing story, but the reading of it wasn’t particularly enjoyable for me. Larkswood flits back and forth between two periods of time – 1896/97 and 1939, just before the outbreak of the Second World War. The book begins in 1897, and reveals an event at the heart of the book, but it isn’t about the main protagonist, Louisa Hamilton, who enters in the third chapter. I spent the first few chapters wondering who this book was about. To my mind, not a great start. I didn’t mind the travelling between the two periods, as this was well pointed, but the set up at the beginning did not work for me. The writing itself was variable – at times charming and vivid, and others clichéd and underwritten. “She swallowed her breakfast along with her pride,” (yuck), “her father emerged silently but promptly from the shadows” (there must be a better way of writing that), or “she climbed stiffly out of the car”. That said, I enjoyed the direct voice letters of Milly (Louisa’s sister), a very effective device in the book. I had a clear sense of place and setting, Mendes captures this in a way to give the reader clear images in the mind. The premise of the story is a good one, but the telling of it frustrated me as a reader. Larkswood’s characters were all a bit caricature, rather than characters, a little two-dimensional. Evil parents being the root of the damaged children (grandfather and great aunts to Louisa), a tom-boyish Louisa, and her frilly sister Milly. The gardener who is good, solid and handsome. All a little uninteresting for me. In Larkswood, the style of narration grated on me. It is essentially a third person limited perspective, but the narration was at times in the style of the third person, so that it was almost a first person. For example, Edward, Louisa’s grandfather (and somehow both hero and antagonist, which didn’t work for me) is clearly supposed to be super-posh and speaks in clipped tones, without starting his sentences properly, but this wasn’t only in his speech, but his narrational observations. This drove me insane, and was a reason alone to want to hurl the book across the room at times. Mendes, in her notes at the end of Larkswood, said that she wanted to tackle one of the great social taboos, which I shan’t reveal for risk of a spoiler, but, with some expertise in the field, I felt this was naively handled. It was given a rather Hollywood gloss on it with a massive, unlikely reconciliation at the end. I thought Louisa’s confrontation of her grandfather was unconvincing, as was his facing up to his past, as was the degree of forgiveness and acceptance. Mendes wrote that it took seven years to research and write. This took me by surprise, as the book as something of a feel of it being pushed out. Mendes also says that she was a children’s author first, which makes sense on thinking about the book. It was a disappointing read, a disappointing edit and ultimately, sadly, a book that I would not recommend.